Russian Su-25 jets takes off for a mission from Hemeimeem Air Base, Syria, October 22, 2015. Russian officials have given international news organizations their first inside look at Russia's air operations in Syria. The Russian Defense Ministry flew Moscow-based reporters Thursday to the Hemeimeem Air Base near the coastal city of Latakia for a tour. Journalists witnessed Russian combat jets and helicopter gunships flying from the base. Meanwhile, Russian President Vladimir Putin accused the United States and its Western allies of playing a "double game" with terrorist groups in Syria and other parts of the Middle East, by fighting some and using others to overthrow undesirable regimes. "It is always difficult to play a double game, to declare a fight against terrorists and at the same time try to use some of them to put figures on the Middle East [game] board in one's own interests," Putin said. Putin made his comments to a group of political scientists in the Russian Black Sea coast city of Sochi. Russia has been carrying out air operations in Syria for three weeks. It has been criticized for aiming most of its bombs at rebel groups other than the Islamic State group, despite initially saying the extremist group would be a main focus. The United States and Russia have signed a memorandum of understanding on the need for both countries' planes to keep a "safe distance" while carrying out airstrikes over Syria. Russia, a strong ally of Assad, also announced that Foreign Minister Sergei Lavrov and U.S. Secretary of State John Kerry will meet Friday in Vienna for talks. 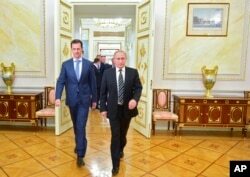 They will be joined by their counterparts from Turkey and Saudi Arabia, both of which are fierce critics of Assad.